As many independent scientists now recognize, fluoride is a neurotoxin.3 The question, therefore, is not if fluoride damages the brain, but at what dose. While EPA quibbles with the methodology of some of these studies, to dismiss and ignore these studies in their entirety for methodological imperfections is exceptionally cavalier, particularly given the consistency of the findings and the razor-thin margin between the doses causing harm in these studies and the doses that millions of Americans now receive. We have also made a comprehensive collection of campaign and educational videos available on a single flash drive for a limited time. It also includes our EPA petition and supporting documentation. This is a must-have for every fluoride-free campaigner’s toolkit.4 Another must-have is the book “The Case Against Fluoride,” by environmental chemist and toxicologist Paul Connett, Ph.D., which contains a comprehensive science-based argument for the end to artificial water fluoridation. Winning this lawsuit will require a full team effort, and we want you to feel a part of that team and a part of this moment in history. Please consider playing a larger role in this potentially fluoridation-ending lawsuit by making a tax-deductible contribution. •There is a new National Institutes of Health (NIH) funded fluoride/brain study.7 Our Canadian friends are extremely excited by this research funding to Christine Till and Ashley Malin, the co-authors of the important study that found a correlation between fluoridation and increased ADHD rates in the U.S.8 This could definitely be one of the most important developments in water fluoridation to date. •The National Toxicology Program (NTP) is in the process of completing a rodent study using low levels of fluoride exposure. However, we have concerns over the consultation process NTP had prior to when this study was undertaken (see “Vigilance Still Needed” at end of this article). •A National Institute of Environmental Health (NIEHS)-funded human epidemiological study titled “Prenatal and Childhood Exposure to Fluoride and Neurodevelopment” is investigating the relationship between fluoride and IQ among a cohort of children in Mexico. A summary of the study10 is available online. •An NIEHS-funded animal study, “Effects of Fluoride on Behavior in Genetically Diverse Mouse Models,” is investigating fluoride’s effects on behavior and whether these effects differ based on the genetic strain of the mouse. The principal investigator of the study is Dr. Pamela Den Besten. A summary of her study11 is available online. Progress is also being made on the political front. U.S. Center for Disease Control (CDC) fluoridation statistics for the U.S. have been released for 2014,14 and they show exactly why the fluoridation lobby has been pouring more money and resources into promoting the practice and fighting our efforts: WE ARE WINNING! More than 460 communities throughout the world have ended existing fluoridation programs or rejected new efforts to fluoridate either by council vote or citizen referendum since 1990. Since January 2016 alone, we’ve confirmed that at least 33 communities with nearly a million collective residents voted to end fluoridation, bringing the number of victories since 2010 to at least 225 communities,15 representing approximately 6.5 million people. 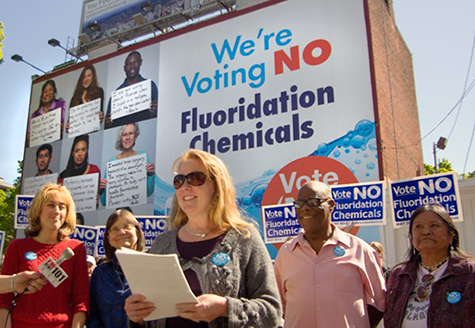 Portland, Oregon — A broad coalition of Portlanders have resoundingly rejected adding fluoridation chemicals to the city’s water supply. By a 61% to 39% margin, Portland voters agreed with the positon of most western nations that there are safer, more effective, and less intrusive ways to promote oral health than adding a chemical linked to thyroid disease, IQ loss, and other ailments to the water supply. “We are proud of our Portland colleagues who used science and integrity to defeat fluoridation and the public relations blitzkrieg that backed it,” says Paul Connett, PhD, FAN’s Executive Director. 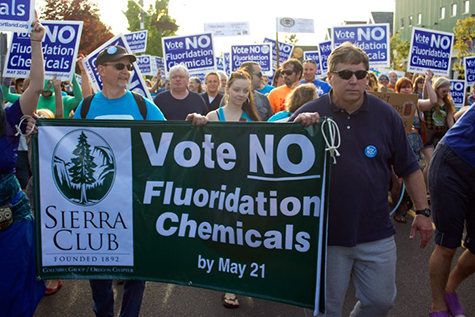 Portland’s clean water campaign was spearheaded by Clean Water Portland (CWP), a broad coalition formed in August 2012 after a newspaper revealed secret ongoing fluoridation meetings with Portland City Council members that were illegally kept off the record. With virtually no public input, the City Council mandated fluoridation for the city on September 12. CWP then led an unprecedented effort that gathered over 40,000 signatures in less than 30 days to halt the mandate and force the referendum vote. Fluoride chemicals are the only chemicals added to public water for the purpose of medication. Most western countries, including the vast majority of Europe, do not fluoridate their water. “Most of Portland’s media falsely reported that fluoridation promoters had science on their side and that opponents used emotion,” says Connett. In 2006, the NRC warned that current fluoride exposures in the US may increase the risk of thyroid disease, endocrine disruption, neurological disorders, and bone damage – particularly among people who have medical conditions that increase their vulnerability to fluoride. The NRC called on scientists to investigate fluoride’s role in chronic disease, but government health authorities have opted against funding this research. 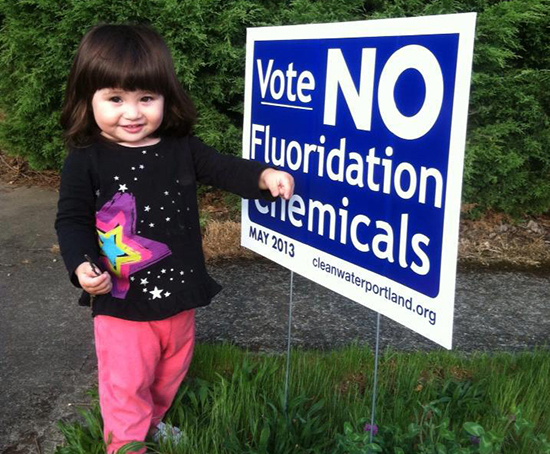 Portland’s vote comes just six months after voters in Wichita, Kansas soundly rejected fluoridation by a 20% margin, and follows close on the heels of an announcement this April that Israel will be ending its mandatory fluoridation program. In Ireland, legislation was proposed this spring that would make it a criminal offense to add fluoride to public water supplies, and in Canada, the number of people drinking fluoridated water has dropped by about 25% since 2008. 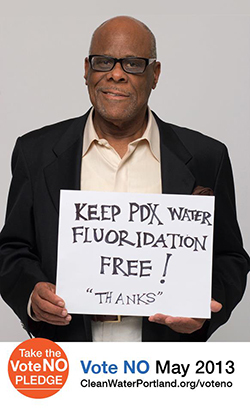 In Portland, opposition to fluoridation included the regional Sierra Club, the Portland branch of the NAACP, Oregon’s Department of Environmental Quality employees union, and more than 200 local medical professionals. National leaders also weighed in, including Ralph Nader, Lois Gibbs, John Stauber, Food and Water Watch, Organic Consumers Association, and esteemed scientists Drs. Theo Colborn, William Hirzy and two members of the NRC’s review. The breadth of the coalition was reflected in polling data showing bipartisan opposition to fluoridation among democrats, republicans, and independents alike, and overwhelming opposition among communities of color. Voters who rejected fluoridation were concerned by research showing low-income communities to be at highest risk of fluoride’s adverse effects with virtualy no offsetting benefit. This fact was not lost on Portland’s low-income neighborhoods, which voted overwhelmingly against fluoridation. Fluoridation proponents had a massive war chest, raising almost $1 million. They used their nearly 4-to-1 funding advantage and media clout to flood Portland with misleading ads and editorials touting fluoridation as an urgently needed tool for solving the “dental crisis” in the city’s poor neighborhoods. But there really wasn’t a dental crisis in Portland as the Oregon Department of Health’s own reports indicate. Fluoridationists tried to hide this inconvenient truth, pressuring state officials to not publicize new Smile Survey data showing Portland children’s decay rates have improved without fluoridation and, in fact, are better than most fluoridated cites. “Fluoridationists had no evidence that any Portland child was fluoride-deficient; but did prove that some Portland children are dentist-deficient. We urge the legalization of dental therapists in Oregon who will treat the low-income children who dentists refuse to treat,” says Connett. (NaturalNews) Roughly 85,000 fewer people living in North America will be forced to drink and bathe in fluoridated water, thanks to four recent community victories preventing or overturning water fluoridation mandates. The towns of O’Fallon, Missouri; Rosetown, Saskatchewan; Lake View, Iowa; and Cassadaga, New York are all now officially fluoride-free, proving that individuals really do have the power to step up and protect themselves against one of the most ridiculous folklores of the past century to be thrust on the people in the name of public health. In Rosetown, SK, the failure of a fluoride feed pump was enough to scrap the outdated practice of water fluoridation, while water fluoridation’s high cost with lack of economic and societal benefit convinced the city council of Lake View, IA, to discontinue the pointless practice. And in Cassadaga, NY, local citizens rejected a proposal to fluoridate by an 87 percent margin, even after the town had already built a special shed to begin housing and pumping fluoride chemicals into the water supply. In Portland, Oregon, where rogue city council members and Mayor Sam Adams recently forced through a fluoridation mandate against the will of the people, more than 43,000 local citizens signed a petition to force the issue to a public vote. As of this writing, these signatures are still being counted — but since only 19,858 were required to get the issue on the ballot, the issue will almost surely be put up for a public vote. And in New York City, where councilman Petter Vallone, Jr. has been working feverishly to end water fluoridation in America’s largest city, a resolution has been introduced to require that a warning about fluoride’s dangers for infants be printed on individual water bills. Both Milwaukee, Wisconsin, and the entire state of New Hampshire recently passed similar requirements for infant warning labels on water bills. Lastly, both the Greater Pine Island Water Association, which serves the area of St. James City near Fort Myers, Florida, and the Ormond Beach City Commission, also in Florida, are also reconsidering their existing fluoridation mandates. The former group will have its members vote on the issue, while the latter group has already approved a referendum that will allow voters to decide the issue in an upcoming election.